Bristol Academy beat Barcelona 2-1 on aggregate to reach the quarter-finals of the Women's Champions League for the first time. 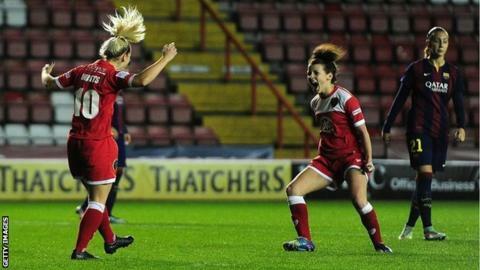 Bristol, who took a 1-0 lead into the second leg at Ashton Gate, drew 1-1 thanks to a late Nikki Watts penalty. Barcelona went ahead shortly before half-time through Vicky Losada's deflected shot following a free-kick. But Watts equalised with seven minutes remaining in front of a club record crowd of 2,457. Bristol, who finished seventh in the Super League this season, are the only remaining English team in the Champions League. The draw for the quarter-finals and semi-finals will be held next week, with the games being played in March 2015. Three-time Spanish league champions Barcelona, for whom defeat in the first leg ended a 55-game unbeaten run at home, were superior in possession on Thursday. However, Bristol almost opened the scoring when Natasha Harding narrowly failed to force the ball home as she slid on to Corinne Yorston's pass. Barcelona made the breakthrough when Jasmine Matthews was penalised for handball just outside the area, and Losada fired home via a deflection after the free-kick was blocked. Early in the second half, Harding shot narrowly wide, while Spain international Natalia Pablos hit the crossbar from 30 yards. Bristol goalkeeper Mary Earps made a reflex save from Virginia Torrecilla before Harding was brought down by Melanie Serrano and Watts slotted home from the spot. Bristol are set to earn €50,000 (£39,700) for reaching the quarter-finals.